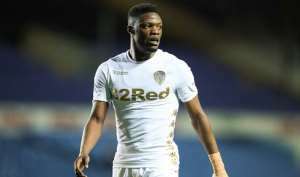 Turkish outlet Fanatik have claimed that Trabzonspor are set to hold sit-down talks with Leeds United over the future of striker Caleb Ekuban in the coming days. Ekuban, 25, has been in blistering form for Trabzonspor this season – on loan from Leeds. The report claims he has a clause in his contract worth £900,000 to make the move permanent. He was deemed surplus to requirements by Marcelo Bielsa last summer after just two goals in 22 games during 2017-18. In Turkey, he has netted eight times and created three more – playing out wide, up front and in the 10 role. The former Chievo star’s excellent form has even seen him earn a call-up to the Ghana national team, where he scored goals against Kenya and Mauritania in his first two caps. The need for sit-down talks seems strange, though, as the report claims Ekuban has told his loan side he wants to join them permanently. Fanatik do say that Ekuban could be signed and immediately sold for profit. Ekuban is surely worth keeping. His form in the top tier of Turkish football is something that simply cannot be ignored by Trabzonspor, and neither should it be by Leeds. The £900,000 clause cannot be cancelled and can be activated only by the Turkish side – if they want to do it. Trabzonspor’s president Ahmet Agaoglu told NTV Spor last week that he would let Leeds keep Ekuban for £10million. That would see Trabzonspor sign Ekuban, and immediately sell him back to the Elland Road side. If Leeds can argue that price down to a more reasonable fee, maybe Ekuban will be worth keeping.